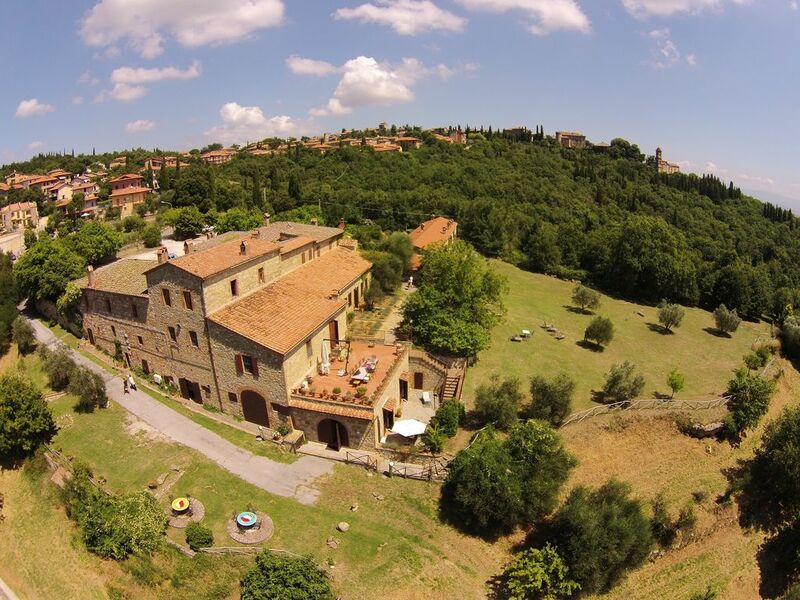 Fifteen delightful rooms created on the premises of a farm with an old oil mill and a gourmet restaurant: this is the Chiusa, a characteristic and intimate Locanda in Montefollonico, immersed in the hills of the province of Siena. We are in Tuscany halfway between Pienza and Montepulciano on the ridge that divides the Val d'Orcia from the Crete Senesi. Granite millstones and old walls kept in view in our rooms are combined with modern comfort, enriched by whirlpool tubs and fireplace, in a unique atmosphere that can only come from original elements that time has miraculously preserved and that have been enhanced for those who want to rediscover the whole atmosphere of lost time intact and suggestive. Absolute tranquility, a rest of the past, a full immersion in the Tuscan countryside, recovered in all its values. "La Terrazza" Deluxe Family Room - n. 4 pax - double bed and sofa bed in another room, large terrace. Bathroom with whirlpool tub and shower, free wi-fi, flat-screen TV, telephone, air conditioning, minibar, safe, hairdryer. Room price and daily cleaning, linen change 3 times a week or on request are included in the room price. The price does not include: additional linen changes and additional cleaning (possible on request), tourist tax. Possibility to book museums, guides and excursions at the reception. Possibility to rent high chairs for children. Small pets are allowed: the supplement is € 10.00 per day. Possibility to add an extra bed for free 0/12 guests over 12 years € 30.00 per night. Meal consisting of four courses to choose between appetizer, first course, main course, dessert. Half board H / B is calculated daily for the entire duration of stay. Our Gourmet Restaurant is open every day except Tuesdays for lunch and dinner. It offers traditional Tuscan cuisine and revisited by our owner the Chef Dania.